I guess I’ve now had my car for six years, based on the number of smog checks I’ve had to have which come every two years after the initial registration. I’ve been rather arrogantly smug about those tests, as the car handily passed the two previous tests with scores well below the average levels (low is good, high is bad). I blame the DMV for my smug attitude, as each time they require me to go to a “Test Only” facility, instead of “Test and Repair” facility, claiming that certain “likely to be polluting cars” are assigned to “Test Only” facilities, so when I handily pass, I mentally flip the DMV the bird. I think the DMV is being cagey or dishonest about these types of facilities, “Test Only” versus “Test and Repair”, because all of them are licensed by the state and are supposed to be entirely honest and above-board. So why should a car “more likely to be polluting” be sent to one kind of facility and not another? It’s as if they are telling you without really telling you that they expect the “Test and Repair” places to be dishonest and will somehow pass you even when you are a polluter, whereas the “Test Only” facilities will “tell it like it really is”. Actually, what makes more sense to me is that a car more likely to be polluting should to be sent to the places that can fix the car, too, which the DMV seems to feel is inevitable, but that’s not how it is. For these tests I have been going to a man whom I call “Mr. Moneybags”, because he has a little Walt Disney Scrooge McDuck figure glued to the top of his testing computer. When I was a kid, I wasn’t allowed to read comic books for reasons I never fully understood—it’s not that I wasn’t already a reader and therefore was in danger of being dumbed down by comics. But somehow there was just supposed to be something “bad” or “trashy” about comic books, not something my fine brain should be subjected to (so instead, I read them at my friends’ houses or at the barbershop; otherwise, I might have grown up never knowing a thing about Archie and Veronica, Superman, Batman, Green Lantern, or The Silver Surfer). However, my mother finally decided that maybe a subscription to a Donald Duck comic would be okay—even that I don’t fully understand, because it wasn’t as if I were begging to get some kind of comic book (after all, as I said, I was reading them elsewhere anyway). 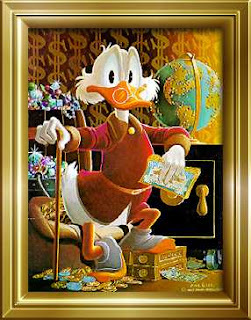 Anyway, I was “allowed” to receive Donald Duck and I must say that I did enjoy the various adventures of Donald, Daisy, Huey, Louey, and Dewey, and Scrooge McDuck, the very rich “uncle” Duck. There was something inspirational about that and I have always loved the idea of people coming here from a foreign country, becoming assimilated into the culture, and making it financially—understanding the opportunities here perhaps better than most of our natural-born citizens do, and having the courage to take advantage. I don’t know if this man is making more money than I am, but somehow I imagine that he is and I think what he did was so easy and so much smarter than what I am doing. How hard would it be, as I imagine it, to take a course on state-approved smog testing, pass a test, become licensed by the state, rent a little garage, lease (probably) the testing equipment, and voila, you’ve got a simple-to-run business that people HAVE to come to periodically. How this man stood out and kept me as a repeat customer for six times was (a) he was very nice, (b) he gives you a $10 discount if you get a coupon from the Internet, or if you, like me, tell him you’ve come back to him, he’ll give you the discount as an “appreciation”, and (c) he has a nice little “comfortable waiting area” set up outside on the parking lot with an umbrella, two outdoor chairs, and a table. Anyone could do those thoughtful little things, yet I’ve not seen anyone anywhere else doing them. Not that I would want to earn my living with a smog testing facility—that was just an example. I just feel that this represented a relatively easy and quick creation of a money stream that didn’t carry a whole lot of risk and I think all of us need to understand the possibilities of that kind of thing. Who knows what will happen with our jobs in the future (outsourced to India!) or how long we can stand “working for the man,” as they used to say in the 60s. To be honest, I wasn’t so secure about the test this time. I had noticed lately that I was getting worse gas mileage than normal, averaging a pretty terrible 9.5 miles per gallon around town. I was due for an oil change and figured that when I went to Harry, my mechanic, I would discuss it—maybe it was time for a tune-up. And sure enough, I did not pass. In fact, I failed big time. Mr. Moneybags was nice about it, though. He didn’t say “You didn’t pass,” or “You failed”, instead he said, “You didn’t make it this time.” And then he showed me how much I hadn’t made it. The computer had printed across the testing sheet “GROSS POLLUTER”, which means “We the people of California want you to get this car off the road!” On one measure, for example, the maximum allowed was 0.48, but I had 10.11, and on another, the maximum allowed was 82, and I had 414. Even though what was coming out of the exhaust pipe was invisible, it was many time times the level of smog-producing material than the standard allows. I thought I saw Al Gore standing off in the background, grinning a devilish grin, although I can’t blame Al Gore for this, as this standard has been there for years. Junk the car? What’s this talk of junking the car? Mr. Moneybags was relatively positive, however. “I think it must be something like the oxygen sensor,” he said, citing something that didn’t sound very expensive to fix. Oh, just replace a sensor and all will be well, right? I took the car to Harry, who looked at the smog test readings and I repeated the hopeful “oxygen sensor” idea. “Well, that could be part of it,” he said, but he pointed out various other failed sections of the test and said, “There’s a lot of other things going on.” Well, we would just have to see. I left the car with him that night so that he could work on it the next day. The car I rented was a Ford Focus, and while I didn’t like it as much as the Chevrolet Cobalt and Chevrolet Malibu, my two previous rental cars this year, I did have fun driving it. It felt almost like a sports car to me and wasn’t too uncomfortable once I figured out how to get the seat back reclined out of the “yoga pretzel kiss your crotch” position. I especially liked its radio (which in that small car was practically in my face, not three arm lengths ahead of me like mine is in the Cadillac), which seemed to clearly pull in about twenty more stations than the radio in my car does. I also liked the idea that it not only scrolled across the screen the names of the radio stations (not just the frequency numbers), but also the names of the artists and song titles. Having a car fifteen years old does sometimes cause me to be surprised to see what new “technology” there is! Later at work, Harry called me to discuss what he found. Basically the way he described it was that when one smog control component went bad, it ended up causing other ones downstream to go bad, too. He’d have to replace the oxygen sensor (Mr. Moneybags was right!) and the EGR solenoid relay (whatever that is), reset the ignition timing, and probably replace the catalytic converter (but he would do that only if the other repairs didn’t get me to passing). He told me that I had been burning a very rich mixture of fuel, which meant that a good portion of it was spewing (invisibly) out the exhaust pipe. “You’ve probably noticed your mileage had gone down,” which, yes, was particularly noticeable now that gasoline costs $3.60 a gallon. It would cost something like $600 to $800 to do all that. “Do you plan on keeping this car?” Harry asked. Well, my only reservation would be that the only other time I had a car that had been declared a gross polluter, I had spent over a thousand dollars in repairs in order to pass the test, only to attempt to drive it to work and discovered that the car didn’t even have enough power to go up a hill. I took it back to the shop and the very same mechanic who had collected all that money in order to get it to pass the smog test then declared to me that I had a cracked engine block and that the car needed a whole new engine. So that car went from “gross polluter” to the junkyard, with all that “smog test passing” money wasted inbetween. “What kind of car was that?” asked Harry. “A 1982 Chrysler LeBaron with a Mitsubishi engine,” I said, knowing full well that in that phrase, I had given Harry no less than three code words for “that car was a piece of junk”: “1982”, “Chrysler LeBaron”, and “Mitsubishi engine”. So I went ahead and approved the repairs. It ended up costing me in the neighborhood of $700 (Harry ended up having to replace the catalytic converter, too), which all-told, I thought wasn’t too bad. Harry got it smogged for me at the “Test Only” shop right door to him, who electronically transmitted to the DMV my passing scores. The California State-approved print-out said, “Congratulations! Your vehicle passed the enhanced Smog Check inspection, which helps California reach its daily goal of removing an extra 100 tons of smog-forming emissions from the air. Thank you for keeping your vehicle well-maintained.” You’re welcome. I felt as though that 100 tons of smog-forming emissions had come from me, but now no longer! As usual, driving the car away from Harry’s felt like I was driving a brand-new car (I had also had the regular oil-change and so on service). And sure enough, after two days of local driving, my average mileage was revealed to have increased to 15.5 miles per gallon. Well, that is more like it! I also got the car washed (at a place whose work is the closest thing to auto detailing without actually being auto detailing), so now I am driving a beauty to be proud of again. Ready for my upcoming trip north to Petaluma and then to Clear Lake for Thanksgiving. Then Thursday, we will be driving two more hours north to Clear Lake where our sister owns a house on the lake, which is where we will be having Thanksgiving dinner. This will be our first family Thanksgiving without any parent attending, and it will be the first family Thanksgiving that will not be in the house of our parents. We’re the oldest generation, now, and it is at holidays like this where you really feel that. So Happy Thanksgiving everybody. It’s been a very hard year for a lot of people I know, including me, myself, but we all still know that we have a lot to be thankful for and that is what will be uppermost in our minds. Just had a similar experience with a beloved 92 Ford Tauris, with only 57K miles. Two years go it passed with flying colors. After my wife had convinced me to sell it for something more reliable, I prevailed that we keep it, and went off expecting a clean smog report. Won't start down the path to repair, so I will accpept the State's offer for a grand, with a tear in my eye. There is another tear in my eye as we fork over 31 big ones for a new Accura, that will be used less than ten thousand miles a year. Thank you, Anonymous on your comment. I hope you get an A on your assignment! Brim over I agree but I think the list inform should have more info then it has.